Hydromar produces two series of bathing platforms: platforms that protrude from a trunk and the Seascape model, which is based on a Z-shaped movement. 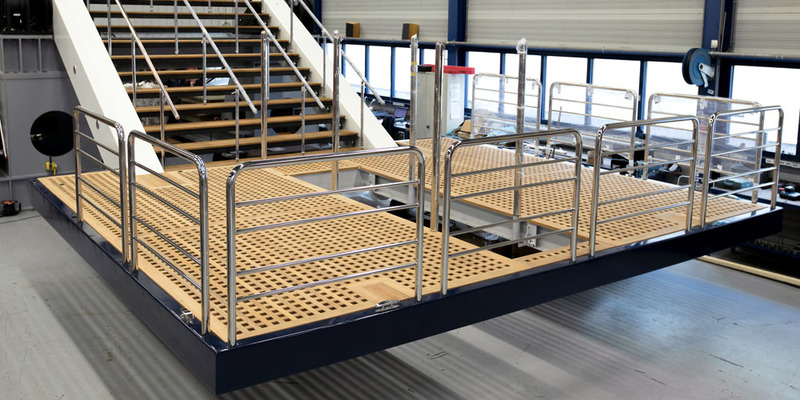 Both are hydraulic moving bathing platforms based on Hydromar’s core competence – tailor-made equipment based on standard solutions – and both are delivered in several standardised sizes. The SSW series come in two standard sizes and are constructed like a boarding ladder. They can be delivered with or without a bottom platform and are constructed entirely in stainless steel. The Seascape, with its unique crankshaft mechanism, represents a major boost to the stability of the steps and platform. It comprises two sets of cylinders which drive the unique crankshaft system. The Seascape is always delivered with a complete and tailored platform. The Seascape come in three standard sizes and a special size XXL. High quality, stability, aesthetics and functional design are the keywords underlying the Hydromar Seascape. The main dimensions of the platform are, naturally, within the standardised variables. Do you need more information? Please give us a call: +31 (0)88 45 70 430 or send a mail to Rob Montijn: sales@hydromar.nl.